To Cite: Rezaeimehr Z, Hosseini S R, Darbandi Z, Hosseini S A, Kheirkhah F, et al. The Association Between Helicobacter pylori Infection and Cognitive Disorder in Iranian Elderly Population, Arch Clin Infect Dis. 2016 ; 11(4):e38193. doi: 10.5812/archcid.38193. Background: Demographic transition and increasing elderly population in Iran can be associated with age related disorders such as dementia. Recently, Helicobacter pylori infection was considered as a risk factor for cognitive impairment. Objectives: This study aimed to examine this relationship between H. pylori infection and cognitive impairment in Iranian elderly. Methods: This cross-sectional study was performed on elderly subjects initially enrolled in the Amirkola health and ageing project. Demographic information was collected using a questionnaire and all participants filled the mini-mental state examination (MMSE) questionnaire. The maximum MMSE score is 30 points. Scores of 25 to 30 out of 30 are considered normal 21 to 24 as mild, 10 to 20 as moderate and < 10 as severe impairment. Diagnosis of H. pylori was made by measuring IgG antibody titers against H. pylori using the enzyme linked immunosorbent assay (ELISA) method. Immunoglobulin G concentration of > 20 ur/mL was considered positive. Results: The study was performed on 1514 individuals with an average age of 69.3 ± 7.4 years. Overall, 836 (55.2 %) of the participants were male. Furthermore, 68.7% of the participants had normal MMSE score and 75.7% were seropositive for H. pylori. The risk of cognitive disorder in H. pylori positive patients (29.8%) was lower than H. pylori positive patients (35.9%) (RR = 0.81, CI95% = 0.67 - 0.97). No significant correlation was detected between H. pylori antibody level and MMSE score (r = 0.039, P = 0.129). Conclusions: In our population of elderly individuals in northern Iran, H. pylori infection was not associated with cognitive impairment in this large population. Dementia and cognitive impairment are the prominent chronic diseases that cause disability and mainly dependence amongst the elderly population around the globe (1). The rising trend has led to an increase in the number of people with dementia from 27.84 million in 2013 to 49.76 million in 2030. Currently in Iran, 7% of the population is aged 60 and older (2). In 2009, nearly 200,000 people were diagnosed with dementia (3). The rapid demographic transition in Iran and the formation of an ageing population can be associated with an epidemic of age-related disorders such as dementia (4). There is a lot of debate about the causes of this syndrome and its different spectrums. There are many factors that may be involved in the development of this disease such as low education, smoking, physical inactivity, depression, obesity, hypertension and type 2 diabetes (5). Therefore, the identification of risk factors for this disorder and dealing with them at an older age can prevent disease or its aggravation (6). Some studies conducted in the recent years have shown that Helicobacter pylori, by producing specific proteins, may have undesirable effects on the central nervous system (7-9). Helicobacter pylori are gram-negative bacteria that colonize in the gastric mucosa of more than half of the global population worldwide. Helicobacter pylori infection is highly dynamic (10). According to the hygiene hypothesis, an early childhood infection can down-regulate immunity, suppressing allergic and autoimmune disorders (11). The prevalence of H. pylori infection varies according to age, socioeconomic status and geographical regions (12). Studies performed in the past decade have reported a high prevalence of H. pylori infection within the elderly population, especially in institutionalized old people, with a prevalence ranging from 70% to 85% (8, 12). In a study from northern Iran, the prevalence of infected people with H. pylori was reported as 74.2% (4). There was an association between H. pylori infection and digestive and extra-digestive disorders, such as chronic gastritis, peptic ulcer and gastric cancer (7). Some extra-digestive disorders are particularly frequent in older people. Several studies have shown a relationship between H. pylori infection and, mild cognitive impairment and Alzheimer’s disease (AD), suggesting that this infection could be a potential risk factor for neuroinflammatory pathologies, especially in developed countries (13, 14). However, the underlying mechanism is still unclear. Biological mechanisms that may link H. pylori with AD include: 1) decrease in serum vitamin B and folate concentration, thereby increasing the concentration of homocysteine, 2) induction of imbalance in regulatory mechanisms of the humoral and cellular immune system that, in relation to homologous epitopes (molecular mimicry), cross-react with nerve components, and cause nerve tissue damage, and is likely to continue apoptosis in neurodegenerative diseases. 3) higher levels of H. pylori-specific immunoglobulin (Ig)G antibody, interleukin (IL)-8 and tumor necrosis factor (TNF)-α in cerebrospinal fluid (CSF), and 4) platelet activation. Additionally, in another study with case-control design that was conducted on 47 patients with Alzheimer’s disease and 101 control cases in Japan, an association between H. pylori infection and cognitive impairment was not found (15). Given the high prevalence of H. pylori infection and the age pyramid in Iran, this study aimed to investigate the association between H. pylori infection and cognitive impairment in the elderly population. This cross-sectional study was performed on older people initially enrolled in the Amirkola health and ageing project (AHAP) (16). All cases were invited to participate in the study by letters, phone calls and home visits, besides providing information about the project. Among the total number of 2234 elderly above 60 years of age involved in the AHAP project, 1514 people participated in this comprehensive project. Demographic information was collected using a questionnaire, including age, gender, education, occupation and marital status. All participants fulfilled the mini-mental state examination (MMSE) questionnaire. The MMSE questionnaire is the most commonly used tool for screening cognitive impairment. Although it can evaluate functions including registration, attention and calculation, recall, language, ability to follow simple commands and orientation, it is not sensitive enough for identifying frontal and executive deficits and visuospatial dysfunction. The MMSE questionnaire has been translated and validated in many languages and used in many countries. The maximum MMSE score is 30 points. Scores of 25 to 30 out of 30 are considered normal, 21 to 24 as mild, 10 to 20 as moderate and < 10 as severe impairment (17). Diagnosis of H. pylori was made by measuring IgG antibody titers against HP using the enzyme linked immunosorbent assay (ELISA) method (18-22) by EUROIMMUN kits (serial number: E130524 Ao-Exp date: 23. Jun. 2014). 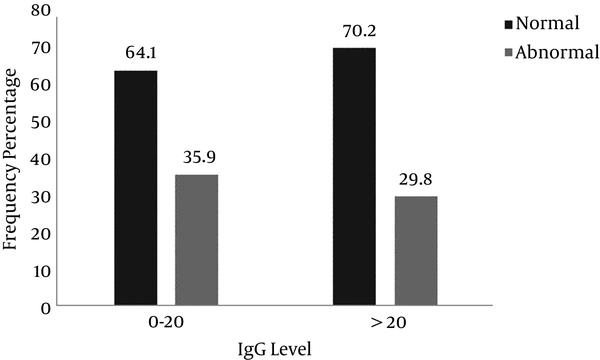 Immunoglobulin G concentrations of ≤ 20 ur/mL were considered negative and > 20 ur/mL positive. The research protocol of this study was approved by the ethical committee of Babol University of Medical Sciences and all subjects were informed before the study (1801). The data were analyzed by the SPSS software version 18, with the following parameters, Pearson correlation, Chi-square test, logistic regression and odds ratio (OR) with confidence interval 95%. P values of < 0.05 were considered statistically significant. The study was performed on 1514 individuals with an average age of 69.3 ± 7.4 years. Distribution of demographic parameters that were evaluated in this study, are shown in Table 1. Overall, 836 (55.2 %) of the cases were male. Furthermore, 982 cases (64.9%) were illiterate. Body mass index (BMI) was more than 30 kg/m2 in 339 cases (22.4%), and 1040 cases (68.7%) had normal MMSE score. No significant relationship was detected between age, diabetes, HTN and BMI with H. pylori (Table 2). Furthermore, no significant association was observed between H. pylori infection and cognitive disorders in the following (P (P = 0.158) while, nine patients (%64.3) who had severe cognitive disorders, were infected with H. pylori infection (Table 3). As indicated by Table 4, no significant correlation was detected between H. pylori infection and MMSE (r = 0.039, P = 0.129). To determine the role of H. pylori infection and other important variables on cognitive impairment, multiple logistic regression analyses was used. The MMSE questionnaire as a dependent variable and the other variables as background variables were entered into the statistical model. Results showed age, gender, education and depression had a significant role on cognitive status and the presence of H. pylori infection had no significant effect on MMSE (OR = 0.96 (0.71 - 1.28), P = 0.767) (Table 5). Figure 1 shows that the risk of cognitive disorder in H. pylori-positive patients (29.8%) was lower than H. pylori negative patients (35.9%) and this differences was significant (OR = 0.81, CI95% = 0.67 - 0.97, P = 0.033). 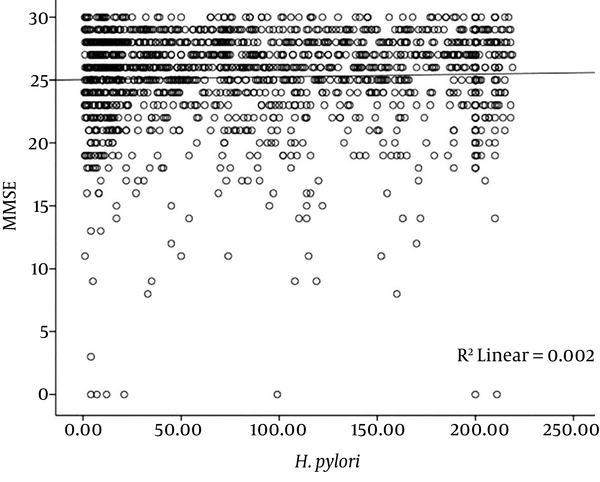 Figure 2 shows that no significant correlation was detected between H. pylori antibody level and MMSE score (r = 0.039, P = 0.129). There was 75.7% seroposivity for H. pylori and 31.3% of participants had cognitive impairment. The results of the present study showed that 29.8% of the H. pylori positive group and 35.9% of the H. pylori negative group had cognitive impairment. In other words, the rate of cognitive disorder in the elderly with H. pylori positive test results was not higher than those with H. pylori negative test results. In a cross-sectional study by Shiota et al. on 482 consecutive patients (385 patients with Alzheimer’s disease and 97 patients with out dementia, considered as controls), H. pylori infection status was determined by measuring urinary levels of anti-H. pylori antibody. The prevalence of H. pylori infection did not differ between patients with Alzheimer’s disease and controls amongst a Korean sample (1, 11). The results of two above-mentioned studies are similar to the present findings. However, in a study conducted in France with a sample of 53 patients with Alzheimer’s disease, Roubaud-Baudron et al. found that H. pylori infection was linked with decreased MMSE score (12). Nevertheless, some studies linked H. pylori infection with cognitive impairment in elderly patients and indicated that H. pylori may play an important role in the pathogenesis of Alzheimer’s disease. Evidence from a large cross-sectional national survey among US adults by Beydoun et al. detected a poorer performance among participants 60 to 90 years old with H. pylori IgG+ versus IgG-, on a verbal memory test (13). A case-control study conducted on 50 patients with Alzheimer’s disease as cases and 30 iron-deficient anemic controls without Alzheimer disease, showed that Alzheimer disease cases had a significantly higher prevalence of histologically confirmed H. pylori infection compared with controls (8). Another case-control study in the same setting, compared cases with an early phase of dementia known as mild cognitive impairment (n = 60) with anemic controls (n = 35). Histologically confirmed H. pylori infection was significantly more prevalent in cases than in controls, and anti-H. pylori IgG titer was notably higher in cases with mild cognitive impairment (20). These conflicting results of different studies reflect differences in the study population, H. pylori prevalence rate and study design. The high prevalence of H. pylori in our population (75.7%) and Japanese population may contribute to the discrepancy between different reports. Additionally, the risk of bias in the present cross-sectional study was higher than other studies with a case-control design. It seems that the type of immune response against H. pylori to the type IgG subclasses are different in developed countries such as USA compared with developing countries such as Africa and Iran. Infection with H. pylori in developing countries may occur in early childhood in the first 30 months, and it creates a type of immune response that leads to less inflammation and ulcers. Diversity of H. pylori genetic, as well as environmental factors (socioeconomic status, diet and smoking), and host genetics may be linked with Alzheimer’s disease. Helicobacter pylori virulence factors and mechanisms of neuroinflammatory pathologies in cognitive impairment and genetic markers of host susceptibility to Alzheimer’s disease should be identified but these conditions result in malabsorption of vitamin B12 and folic acid. The lack of these two substances can increase homocysteine blood levels, which cause death of vascular endothelial cells and atherothrombosis problems in the brain vascular system. In another theory that explains the findings of this study, there was brain cell damage due to antigenic similarity between bacterial cells and brain cells (9, 10). Furthermore, several studies have shown a positive relationship between H. pylori infection and ischemic stroke, suggesting that this infection could be a potential risk factor for ischemic stroke (11, 12, 14). However, the underlying mechanism is still unclear, and different studies have reported conflicting results (8, 23). To the best of our knowledge, no previous study has assessed the relationship between H. pylori infection and hemorrhagic stroke. Moreover, data on the possible risk of atherosclerosis in the small arterioles of the brain in patients with asymptomatic cerebral small vessel disease and H. pylori infection are lacking. Therefore, this study aimed to examine the association between H. pylori infection and cerebral small vessel disease. Regarding the limitations of the current research, at first it seems that the most important limitation of our study was the cross-sectional design, in which it is difficult to find cause and affect relationships. Second, the determination of H. pylori infection in this present study was according to ELISA and not confirmed by histology as the gold standard diagnosis of H. pylori. Also, the lack of full medical history and chronic diseases in the elderly can be considered as weak points of the study. In paralleled to populations at high risk of AD, but it is suspicious that the differences in strains are large enough to fully explain their differences in AD risk. According to the fact that the result of this study belonged to the first part of a cohort study, therefore it is recommended to eliminate the limitations in the second phase of the cohort study and determine a stronger plan for a study to achieve more generalized results. Alternatively, in the next phase of Amirkola’s cohort, it is suggested for older adults to be examined more accurately for H. pylori, or to compare the progression of cognitive disorders in elderly people without infection with a healthy group of individuals. The results of the present study showed that H. pylori infection is not associated with cognitive impairment in this large population. We would like to thank the clinical research development unit of Rouhani hospital of Babol. Authors' Contribution: Study concept and design: Zardis Rezaeimehr, Zeinab Darbandi, Seyed Amirhossein Hosseini, Farzan Kheirkhah, Ali Bijani, Masomeh Bayani; acquisition of data: Zardis Rezaeimehr, Zeinab Darbandi, Seyed Amirhossein Hosseini, Farzan Kheirkhah, Ali Bijani, Masomeh Bayani; analysis and interpretation of data: Ali Bijani and Masomeh Bayani; drafting of the manuscript: Masomeh Bayani and Zardis Rezaeimehr; critical revision of the manuscript for important intellectual content: Masomeh Bayani and Zardis Rezaeimehr; statistical analysis: Ali Bijani, Masomeh Bayani and Seyed Reza Hosseini; administrative, technical, and material support: Farzan Kheirkhah, Ali Bijani and Masomeh Bayani; study supervision: Farzan Kheirkhah and Ali Bijani, Masomeh Bayani. Funding/Support: Babol University of Medical Sciences.